What are the NET Rankings? The NET has drawn some criticism, especially after the laughable first release of the rankings. But the NET rankings are now supposed to be the selection committee’s primary metric for arranging the NCAA Tournament field. Well, the NCAA Tournament field of 68 was revealed on Sunday, and for the teams on the bubble, the NET rankings didn’t seem to mean much. 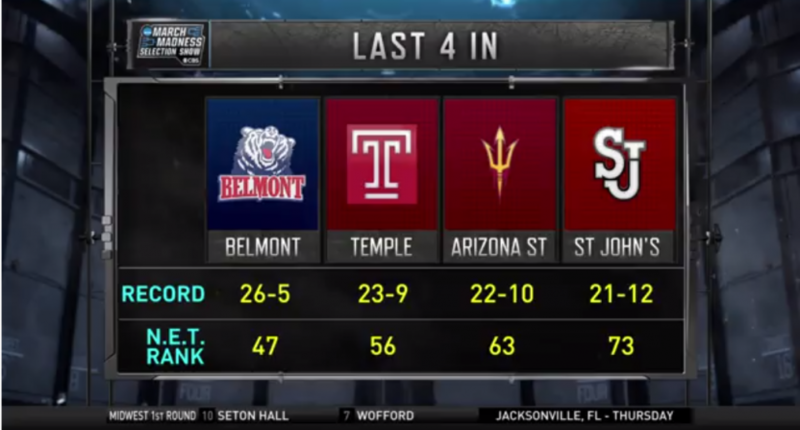 The last four teams in have NET rankings of 47 (Belmont), 56 (Temple), 63 (Arizona State), and 73 (St. John’s). Meanwhile, teams with NET rankings of 33 (NC State), 35 (Clemson), 52 (TCU), and 54 (Indiana) were left out of the tournament. There are obviously several factors at play in the selection process, as there should be. But for how much the NCAA played up their new fancy metric over the last several months, it’s interesting how little the NET seemed to matter for selecting teams on the bubble, and will be something to keep in mind next year.